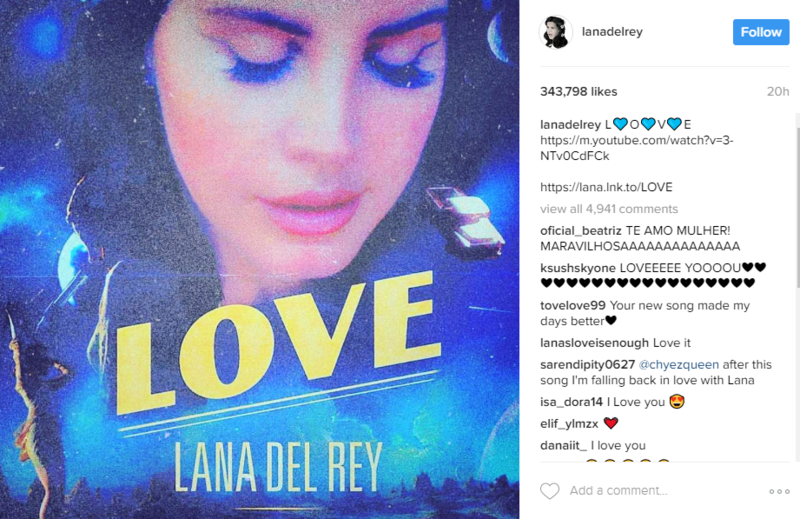 Find Out Why Fans are in “Love” with Lana Del Rey’s Instagram Post! If you’re looking for Lana Del Rey’s music, then we have just what you need from the “Born to Die” singer! The New York City native just released the music video to her new single, “Love” and fans can’t get over how good it is! Lana Del Rey’s fans have already had a chance to listen to her new hit song, “Love” and now they have a chance to not only listen to it, but see the story behind the music. The 31-year-old took to Instagram to announce her new song’s music video on YouTube. The post has more than 300,000 views and earned more than 4,500 comments, all loving Del Rey’s new song. Most fans are in awe over the Internet’s Lana Del Rey pics, but her new single just took over. The young singer was dressed in a white lace dress with daisies in her hair, when the video starts in black and white. It’s her most infectious song so far and its message is that being young and in love is the best thing on earth. The video has a sci-fi theme complete with cars, trips to the moon, teens in love and a ‘50s vibe that you can’t help but appreciate, despite being decades before our time. The video has more than 11.0 million views and the number is only growing! Looks like Lana Del Rey has a single that is sure to get her an award, or at least a nomination!